After last year’s somewhat damp squib of a tournament (Murray’s history-making aside) there has been much to remember in the 2014 edition, not least another entry into the Major Finals hall of fame. But before we get to the vastly different trophy matches, lets revisit that second week at SW19. Firstly, an apology – as in my last post I made a glaring omission within the ‘A good week for….’ List of players. Not only should Barbara Zahlavova-Strycova’s seed-killing run have warranted a mention therein, it really should’ve made the ‘Heroes’ section. Still much like this post generally; better late than never. One of the more bizarre images that will live long from this tournament is the sad, sorry site of a clearly unwell Serena Williams struggle to do much of anything in an attempted doubles match with sister Venus in the third round. The exact cause is still yet to be confirmed, could it simply be a case of the American legend just not enjoying her tennis at all? Another topic to grab the midweek headlines was that of scheduling, and the Championships oft discussed play-free middle Sunday. In a year which has hardly witnessed the worst rain disruption, the complaints of some at first seemed picky. But with the roof now in place it is true that some players will end up more rested than others – the parity of old no longer exists. Tradition seeps from every inch of the Championships and in my worthless opinion remains a vital badge of honour, true also that those hallowed turfs need some rest and recovery for a few hours over the fortnight. But the AELTC will benefit from looking at some of the scheduling decisions this past fortnight – mistakes were made. The champion dethroned and the rise of the new generation. 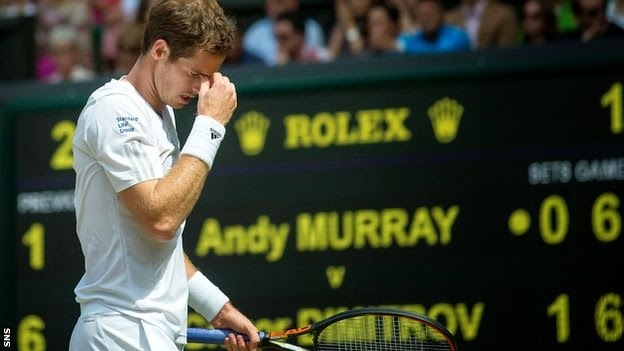 Nothing can take Andy Murray’s Wimbledon triumph last year away from him, his name will forever be immortalised both on that champions board and within the memory of millions of fans. Yet, the manner of the Scot’s unceremonious loss to Grigor Dimitrov in the quarter finals here is a damaging blow. The pretender Dimitrov was threatening to become another up-and-comer who would flatter to deceive throughout a much hyped career. That may still prove to be the case – one major semi-final does not a fine player make – but this is a new Bulgarian beast. In a similar vein to Simona Halep, Dimitrov has been collecting his first raft of titles these past twelve months and looks ten times the player for it. Baby Fed is now hitting with conviction and belief, and adding power and the ability to do the basics and hard graft as well as his magical polish that would in the past be relied upon too much. He played out of his skin to defeat the British number one, but this was the Murray of old, the defensive pusher who merely waited for the mistakes to come and offered little in the way of verve or vigour. Again, we don’t really know the reason for this sudden change – the Scot has looked close to his devastating best for most of the last two majors. Along with the back surgery recuperation there is the loss of Lendl – this one feels is the biggest catalyst. Gone too is that aggressive shot-making and assured serve that elevated Murray’s already stellar game into slam-winning territory. That looks a long, long way away. Dimitrov needs to build on his inroads here to really cement himself amongst the new challengers. He may have to fight with similar young guns. In Nick Kyrgios we have (perhaps) the new Aussie hope. Rafa’s conqueror certainly has the game – especially on the green stuff – and now needs to continue to show that maturity and level-headedness that belied his 19 years. A shout out too for Milos Raonic who needs to find a few more strings to his Roddick-esque bow to really challenge. But this Wimbledon performance was richly deserved. Like Lisicki last year and Sharapova before her Eugenie Bouchard was the undisputed starlet of this year’s Wimbledon. A magical run to the final and another impressive list of victims only confirms the Canadian as The Next Big Thing. Two slam SF’s and a final (on three different surfaces of course) is the Real Deal. What makes Genie even more refreshing is that guile and tactics-heavy playing style, a world away from mere one-dimensional baseline bashing. A shame then that this proved her undoing come the final hurdle. All too often an anti-climax, the ladies final was another non-contest as the resurgent 8thseeded Czech demolished her young opponent in a dazzling display of controlled power. Kvitova wowed us all en route to the title in 2011 and subsequently faded in the intervening years. I say faded but this was nothing like an Ivanovic or Wozniacki wilderness; instead Kvitova remained in and around the top ten but had seemingly embraced inconsistency. You have to look at that third round battle with Venus as the catalyst for Petra’s regained belief and momentum. Poor Bouchad – undoubtedly the crowd favourite – simply had no answer to a level of measured and accurate groundstrokes and a booming serve. Quite frankly I doubt anyone could have surmounted a challenge. Both will be back fighting for similar accolades, if history repeats itself then it may well be the Canadian who lifts a major title next. I cannot add much to what has already been written on this titanic contest and modern classic match. My love for the Swiss ensured I lived and breathed every point of the five set epic on Sunday. The grey hair keeps on coming. The match had everything; from the picture-perfect and ridiculously tight first set, to the drama ensconced fourth by way of two more quality oozing chapters and finally, that breathless decider, the encounter was one of the highest pedigree. Even if the match itself had been a disappointment, so much was at stake that it would remain engrossing and rightly hyped. In Federer the world would most likely be witnessing the last genuine stab at an awe-inspiring 18th major title, a final footnote in a spellbinding career and an almighty thumbs up to the doubters, haters and frankly clueless voices who had written off the great man years ago. But Djokovic had comparable baggage and arguably even more at stake. I hadn’t really noticed the stats over time, but the Serb had begun to garner a reputation for a major choker (Chokevic?). As despite his six slam titles, Djokovic had lost his last five in a row – most humbling of all being that non-event against Murray here a year ago. After producing his elastic, powerful best and cementing his label as the finest returner of this generation and perhaps of all time, Novak again found himself grabbing at defeat from the welcoming jaws of victory. After Federer stole the first set tiebreak Djokovic’s youth, pace and perfectly executed game-plan garnered the next two. He had kept his illustrious opponent silenced, denied Federer any momentum or a sniff of rhythm (which usually spells the end for whoever is across the net), but when it came to the crunch Novak had crumbled once more. Cue a familiar sight: Djokovic floundering in every department and looking weak, wounded and ripe for annihilation. At the beginning nay even halfway through that final set, after coming back from the 2-5 brink in the fourth, Roger must’ve been confident of that fairytale triumph. But Djokovic, after saving a surely fatal break point in the seventh game suddenly and immediately found his A-Game shaking his opponent mentally and physically. Just six points separated the two greats after nearly four hours, remarkably the duo committed just 50-odd unforced errors between them in that time. It was that good. By most accounts, Federer has missed his chance, unless he lucks out with his opponents I fear that to be true. For Novak, there’s never been a better time to stamp his authority on the men’s game once more.